Let me introduce you to our church theme for 2018. I truly am persuaded that God is able, and I am even more persuaded that I am not able. As God laid this theme on my heart, He also laid on my heart to put together a daily devotional for our church and for anyone that would be interested in it. God laid on my heart to write something every day, for the year 2018, about things that I am persuaded that God is able to do. This is meant to be an encouraging devotional. Every day to be reminded, not of what we cannot do, but of what God can do. This devotional will be available every Monday through Saturday. We will not be doing one on Sundays because hopefully you will be receiving instruction from God’s Word at church. It is my prayer that every day we will become even more persuaded that God is able. This devotional will be available by email early every morning, http://devotions.kerwinbaptistchurch.com ,it will be available through our church website, and will be available on our church app. 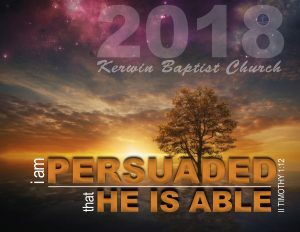 If you would like to receive this by email, simply send your email address to office@kerwinbaptistchurch.com either through our church website or directly. Our church website is kerwinbaptistchurch.com and you can download our church app on your phone through your App Store. Please join us every day to be reminded of what God can do!